To me, these are some of the most emotion-filled words contained in the gospels. Jesus has just miraculously fed thousands. Naturally the crowd loved this and wanted to make Him king “by force” (John 6:1–15). Jesus, however, did not come to be their bread king, a perpetual vending machine. Jesus was on a different mission. So He slipped away. The next day Jesus made His purpose clearer by saying, “I am the bread of life; whoever comes to me shall not hunger, and whoever believes in me shall never thirst . . . for I have come down from heaven, not to do my own will but the will of Him who sent me” (vs. 35, 38). As His listeners grumbled about these words, Jesus pressed them further by saying, “Whoever feeds on my flesh and drinks my blood has eternal life, and I will raise him up on the last day. For my flesh is true food, and my blood is true drink” (vs. 54–55). The Apostle John records that many of Jesus’ disciples heard these words and replied, “This is a hard saying, who can listen to it? Soon after, many of them left and no longer followed (vs. 60–66). These words are emotional to me because His question regularly reverberates in my heart. I want to turn back all the time. Following Jesus is hard, and He’s always breaking my paradigms. I’ve left jobs, cities, friends, and financial stability. As if that wasn’t enough, people have left me too, whether friends who believed the church-planting journey was too hard or family who don’t seem to get me. My life is (and has been) filled with leaving. Do I want to turn back? Regularly. Then I survey the other options and respond with Peter, “Lord, to whom shall we go? You have the words of eternal life, and we have believed, and have come to know, that you are the Holy One of God” (vs. 68). Followers of Christ are regularly confronted with this question because Jesus always seems to want more. The longer we follow, the more personal things get. As the Spirit presses in to the deepest places of my being, my discomfort grows, and turning away looks attractive. An institutional faith looks to someone else to make things easier. It looks to religious leaders to interpret scripture the way I like, to organize faith-filled activities that fit into my schedule, or to fix the relational issues that inevitably pop up as I live in proximity to people. This idea of personal ownership is just another way of describing the doctrine of the priesthood of all believers (1 Pet. 2:5–9). We are all called to go straight to God, to listen, to ask, and to obey. Doing that is uncomfortable, inconvenient. Doing so means putting down my agenda, my desires, my trajectory. Once when my family and I had moved to a new city, standing in the midst of boxes I said to Amy, “Look at all we’ve become. If only our friends could see us now!” Of course, this was a joke meant to highlight that God’s plans often take us to the places we do not want to go. Jesus’ words to Peter make more sense to me now when He said, “When you were younger, you went where you wanted. But when you are older, you will be led to the places you will not want to go” (John 21:18, my paraphrase). Maybe one definition of Christian maturity is the willingness to be led to the places we wouldn’t naturally go? “Will you turn away?” is another way of Jesus asking, “Are you going to turn to what you think will be a better story?” Yet when I reduce it down, I see that being led to the places I haven’t wanted to go has been the best story. My life looks confusing on the outside. Some weeks I’m in the corporate world working with teams on important strategies. Other weeks I’m grilling out in the worst part of town. Our missional community incarnates in a neighborhood that sits next to an empty loading dock in the shadow of an abandoned factory. It’s not the story I would have written for myself. Yet each evening when we go to bed, my wife and I share stories of those we met. We pray for them, and we realize we’re not too different. This isn’t just a different model of church (which is what I hear all the time). No, this is a life where Spirit-dependence is required. The reason things are uncomfortable is because we’re always being taken to places beyond our ability. To turn back means going back in to a mode where we can control things. This is why Jesus said that following Him meant dying (Matt. 16:24–26). Missional communities are not rocket science. Really, the only complicated thing about them is unlearning our tendency to control things. 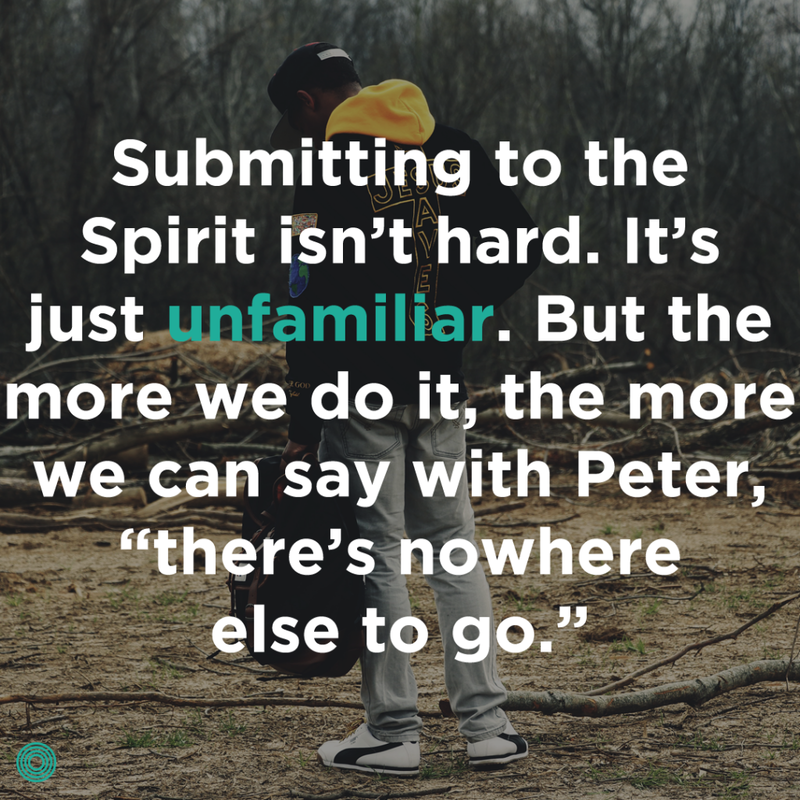 Allowing the Spirit to move in to our hidden places feels strange at first, but when we do it, it inevitably results in healing, reconciliation, and new direction. Missional communities then aren’t even the point. 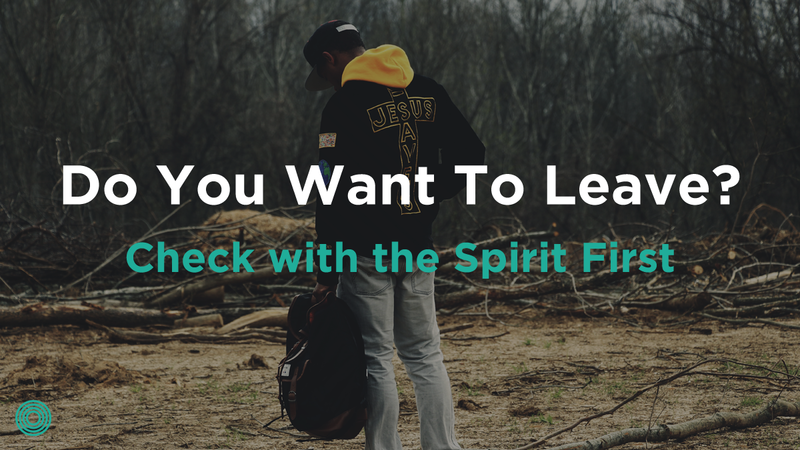 The point is forming mature disciples who know how to listen to the Spirit and go into all the world. Part of the work I do through Saturate is overseeing our coaching communities. When we designed them a few years ago, we wanted to do it in a way that wasn’t prescriptive. Instead, we wanted to create an experience that helped church-planters learn to listen to the Spirit. That’s why we ask questions before we give processes. That’s why we listen more than we speak. This is what it looks like to live by the Spirit. This is what it looks like to live in and lead a missional community. This is what it looks like to plant a church. This is what it means to be a disciple. It’s all about listening. Do you battle with wanting to leave the mission of Jesus, too? My most common temptation is not to walk away from the Lord or from His will for my life as a whole. Instead, I desire to walk away from where I am now and go to serve somewhere else where I will experience a deeper effectiveness and servant-significance. I have been a pastor for 30 years, in the same church for 20 years now, and have a constant sense of ineffectiveness. I have been trying to move myself and others into the ways of real discipleship without much progress. I seek to stay faithful to the Lord here, but I wish He would use me somewhere else. pdkidd61, thank you for your comment. I can identify with your words. Being in the “in-between” phases where we do not yet see the results we long for is difficult. I find, however, is that this is the place where the meaningful personal work happens. Hence, “examining the dark corners” quote in the blog. Leading others, in whatever capacity, is truly a servant role. We are there to see them grow and change. When they do not reciprocate how we think, that can be painful. I admire you, to serve in the same capacity for so long is what Eugene Peterson would call “a long obedience in the same direction.” Thank you for your service. I asked a mentor once how he knew it was time to leave. His answer was simple. “Have you done what the Lord called you to do yet?” he answered. “If you have been faithful to what he called you to, then begin praying for an open door to move on to the next place.” Maybe that’s a question to wrestle with. What has God called you to do. Have you done it? Thank you for your comments. Many have reached out to me on this subject. Thank you for recording your comments here.